Wilfred J. Schroeder, 90, died on Sunday, Jan. 19, 2014. Will was born Dec. 11, 1923 in Alexandria, SD to Matt and Elizabeth (Koch) Schroeder. Will attended elementary through High School in Alexandria, S.D. He started college at the School of Mines in the fall of 1942. On Feb. 17, 1943, Will married Mary Allington in Rapid City, S.D. He served in the Navy during WWII and after an Honorable Discharge in 1946, he returned to finish his degree. Will was very proud to have graduated from the School of Mines with a B.S. degree in Civil Engineering. His first job was with Dakota Engineering Co. from 1949-1952. He then bought a house moving business in Mitchell, S.D. which he operated until 1957. After selling his business he worked as the Mitchell Assistant City Engineer from 1957-1959. 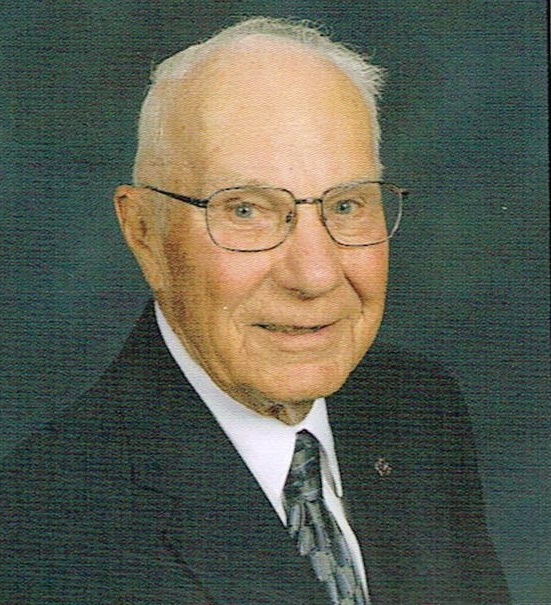 Will moved his family to Sioux Falls and began his career for Gage Brothers Concrete Products, Inc. in 1959 and retired as Vice-President of Engineering in 1993 at the age of 70.Will was a charter member of St. Michael Catholic Church and served on the Building Committee and Parish Council. He was proud that he had a part in the building of the Church and personally designed the Bell tower. He was a member of Catholic Order of Foresters. After being appointed Grand Knight of the Maher Council in Mitchell, Will remained an Honorary member of the Knights of Columbus.During his engineering career he was elected as President of the Southeastern Chapter of S.D. Engineering Society and State President of the S.D. Engineering Society. At various times of his life, Will was also a member of the Elks Club and Moose Lodge. Will continued to be a member of the Hartford Central Valley Golf Course. He enjoyed golfing daily, weather permitting, with his golfing buddy Vic Brinker and others he met on the course. He loved time spent with family playing games, celebrating holidays and family events. Will also enjoyed crossword & suduko puzzles, his daily workout and listening to O'Gorman sports. Those left to cherish his memory are his 6 children: Dennis (Lavonne) Schroeder, Miles City, MT, Rick Schroeder (Marlys Kaiser), Humboldt, SD, Liz (Dave) Reimer, Nancy (Ken) Willemssen, Judy (Scott) Christensen and Brad (Joy) Schroeder, all of Sioux Falls; 14 grandchildren; 15 great-grandchildren; 2 brothers: John and Don; 4 sisters: Edna Weber, Agatha (Ralph) Weber, Agnes (Bill) Geppert and Mary Erpenbach; 2 sisters-in-law: Florence Schroeder and Christena Allington; plus numerous other relatives. He was preceded in death by his wife, Mary; his parents; a brother, Art; and a sister, Frannie. Visitation will be Thursday, 5 PM at St. Michael Parish with a Scripture Vigil at 7 PM. Mass of Christian Burial will be Friday, 2:30 PM at St. Michael Parish.